Michael Bay is back to blow more things up. 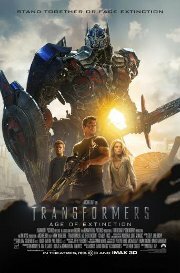 In this episode, set four years after the last outing, an auto-mechanic and his daughter discover a buried Transformer, which leads to the return of the Autobots and Decepticons. This of course provides the reason for lots of violence and explosions, and a new type of robot: the Dinobots. This film is releasing in 2D, 3D, and 3D IMAX, this is the 3D version.